Victims' advocate says at least four Carmichael residents allege they suffered sexual abuse at the hands of former Jesuit High School teacher Brother William Farrington. In the wake of new sexual molestation accusations lodged against a former Jesuit High School teacher, a member of the Survivors Network of those Abused by Priests says he has letters from at least four more Carmichael locals alleging abuse by Brother William Farrington. Joey Piscitelli, Northern California Director of SNAP, said Farrington's purported Carmichael victims contacted him directly within the past 13 days, after a former student at San Jose's Bellarmine College Preparatory School went public with accusations that Farrington molested him there in the 1960s. The Carmichael letter-writers claim they were abused by Farrington while he worked at Jesuit High School, Piscitelli said, though he did not give details of the allegations. SNAP is a victim's rights group focused on bringing awareness to past and present cases of sexual misconduct by clergy members. "Most of these clergy predators have escaped justice or punishment, as the antiquated statute of limitations has passed for conviction, and the abusers have slid by the radar, and are not posted on Megan's Law database," Piscitelli said in an e-mail. Similar allegations surfaced against Farrington in 1987 while he was a teacher at Jesuit. Farrington was barred from teaching following the controversy. Patrick Walsh, a representative of the Provincial of the California Jesuits, said the religious order will notify Jesuit High alumni if more allegations of misconduct are discovered. "(The Provincial) is saddened when these things happen and they're concerned for the individuals making the allegations," Walsh said. Walsh explained Farrington was barred from practicing public ministry and lives under close supervision at the Jesuit infirmary in Los Gatos. Farrington is reviewed annually by a lay advisory board that includes medical professionals, law enforcement and business leaders from the local civic community as is required as part of his ban from teaching and public practice, Walsh said. Piscitelli noted that those who have come forward to speak against Farrington aren't alone. Just 11 months ago, Jesuit was at the heart of another sexual molestation scandal involving Rev. 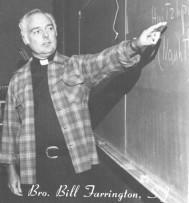 William "Bill" Feeser, a priest of the Diocese of Sacramento who worked at the schooll from 1982 to 1995. Continuing to bring attention to these incidents will help protect students today from misconduct by clergy members, Piscitelli argued. Anyone who has experienced sexual abuse by a Jesuit of the California Province may contact law enforcement and the Victim Advocate for the California Province Ms. Mary Pat Panighetti at 408-893-8398. Piscitelli can be reached via the SNAP website at www.snapnetwork.org or by phone at 925-262-3699.